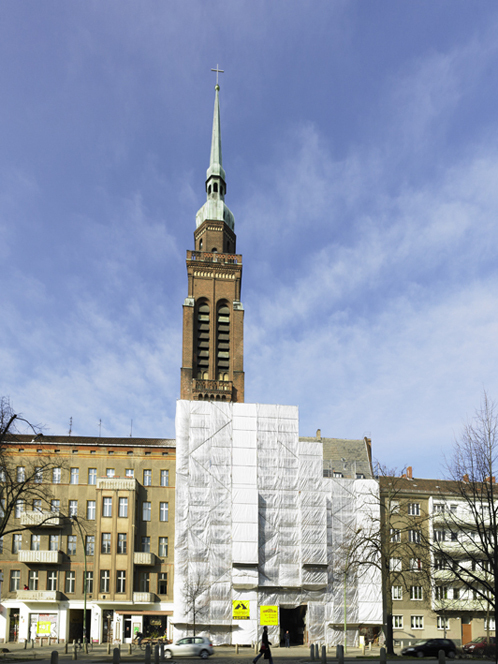 For the latest in Victor Brigola‘s series photographing Berlin’s infill churches, it would be trite to talk about how nice buildings can look when covered with scaffolding and tarpaulins. That’s true, but such an observation would merely point out the obvious, and will therefore be refrained from. In a sense, the presence of such a covering simply heightens the rather abstract structural qualities that these churches all seem to have. None of them are as elaborate in their detailing or as dense in their rendering as the models from which they were derived, in spite of the fact that their façades are generally coated in a rife-running admixture of decorative treatments. And in this case, as the church + cloister stood before the photographer on a chilly morning last spring, the most juicy parts of all have been both muffled and abstracted. Beneath the white sheathing can be found the rich combination of a loggia, crenellated turrets, a circular white clock face and a broad, gothic-arched drive that leads to an inner courtyard which is has been touted as a verdant Shangri-La, far removed from the city’s bustling streets -in essence, a real hodge podge of turn-of-the-19th-century eclecticism. The architect, whoever he was, truly red-lined his understanding of historical styles, having shifted his encyclopaedic knowledge of them into a proverbial overdrive, if you will, which was his reward, perhaps, for having finished top of the class at some stiflingly oppressive Wilhelminian Bauakademie.